I know my heart is healing. Today I flipped through pictures and when I came upon Tia’s photograph, I didn’t weep. It still hurts, but the pain is shifting. Society encourages us to get over our feelings of grief quickly, yet I struggle with that idea. I find it difficult to rejoice about moving on and leaving an important part of my past behind. Instead, I want to savor the emotions I feel about Tia, even if it means having to experience my grief a bit longer. At some point I know I’ll associate Tia with wistful, happy memories, but for now my feelings are still a mixed bag. I thought my first few rides this spring would be fraught with emotion, but Dharla has kept me focused on the present. Oh, the joys of riding a young, green Arabian! Yesterday’s ride was the first time I actually let my mind wander a bit. I’ve tried hard not to make too many comparisons between the mares, but there are certainly a few similarities. When I went to cue Dharla for our first canter together I couldn’t help but think of Tia and her beautifully collected, rocking horse gaits. Dharla’s comfortable … not as collected as Tia was, but she’s young. She’ll get there. As Dharla and I rode along a large shadow passed over us and when I looked up, I saw a hawk soaring close overhead. Again, I thought of Tia. Hawks will always be connected to my memories of Tia. So often they silently shadowed us on our rides. When I see a hawk now I wonder if it’s Tia’s spirit guide, come to make sure Dharla and I are doing well? I know that sounds goofy, but I’ve consistently noticed the close presence of a hawk on several key occasions since Dharla arrive. It seems a little odd to be just a coincidence. I’m usually not one to buy into mythology or fantasy, but if spirit guides do exist then I hope it tells Tia I miss her, but that Dharla and I are doing fine. Sept 14, 2010. 8:28 PM EST. I glance at the clock as though knowing the time might stop it’s advance. Twenty, fifteen, then all too soon only five minutes remain. I struggle to keep my knees from knocking, my heart from pounding as the seconds slip by. I wish I could prevent this moment from coming, yet I’m shocked by the relief that washes over me when the truck pulls up the drive. Numb with dread, I stumble to the barn. A trip I’ve made a thousand times, now surreal and unnatural, altered by my intent. Caretaker, partner, source of all things good, abruptly transformed into a role I never wished to bear. Not wanting to startle her, I call out as I round the far end of the building. Curled like a small fragile doe, I find her laying in the corner of the loafing shed. Tired, uncomfortable, a freckled ear flicks in my direction. She knows I’m there, but doesn’t stir. “Tia,” I whisper, and murmur my private greeting. “Sa, sa, sweet girl.” I fight to keep my voice even, disguise the choking sorrow in my throat. Her soft brown eyes blink twice as I pause to stroke her flea-bitten gray neck before nudging her to her feet. 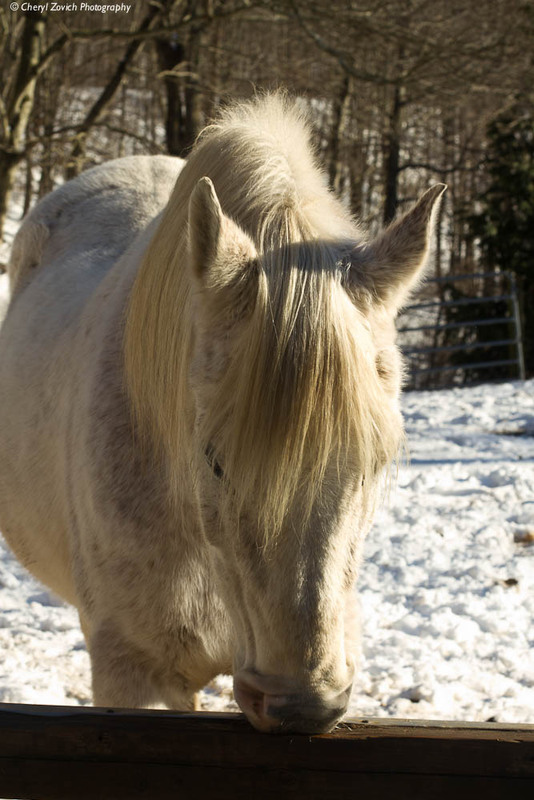 Fatigued, she stands quietly while I tenderly brush the debris from her side, rake my fingers through her disheveled mane and slip the tattered red halter over her lowered head. We leave the shed together and file past the boys who, being boys, barely look up from the feed rack. I want to scream at them, tell them their mare is leaving, but I know words won’t alter our course. When we reach the gate I dare to hope she might balk or refuse to pass; any sign that our destiny is premature. But my hand springs the latch and we glide through the opening side by side. Together we continue our walk down the road, every sound, every sense magnified. The late afternoon sun sits low in the early winter sky and the golden light warms my face. If she senses anything wrong it doesn’t show. Just another stroll on a nice day. We turn onto a trail that winds down a gentle slope and empties into a large stand of ancient white pines. This path we know well as it leads to one of our favorite places; a pretty, peaceful grove that overlooks the dormant pasture below. Off to one side the vet and my husband watch patiently as I scan the ridge, searching for just the right spot. We walk across a thick bed of long, brown pine needles and halt in a place where sunbeams poke through drooping boughs. 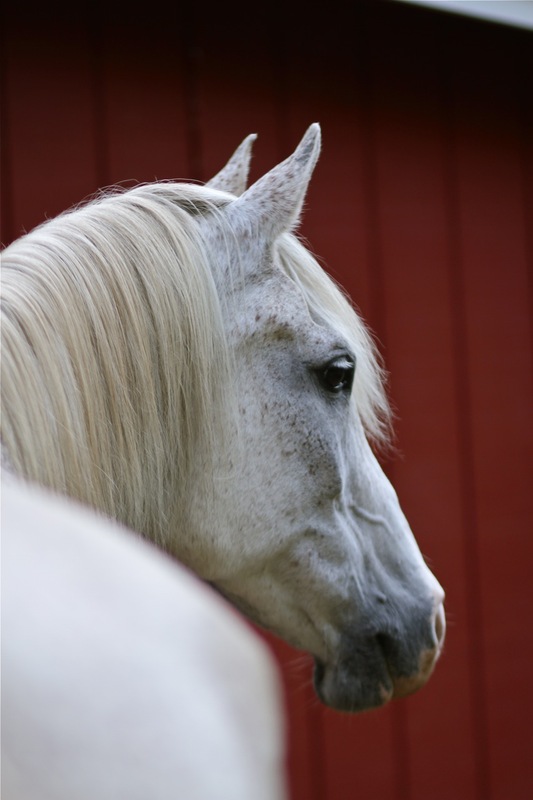 The mare’s fuzzy white sides shimmer in the diffused light and thin wisps of mane lift in the soft breeze. Exhausted from weeks of emotional strain, I step to her head and turn to look down the swayed length of spine that has carried me countless miles. 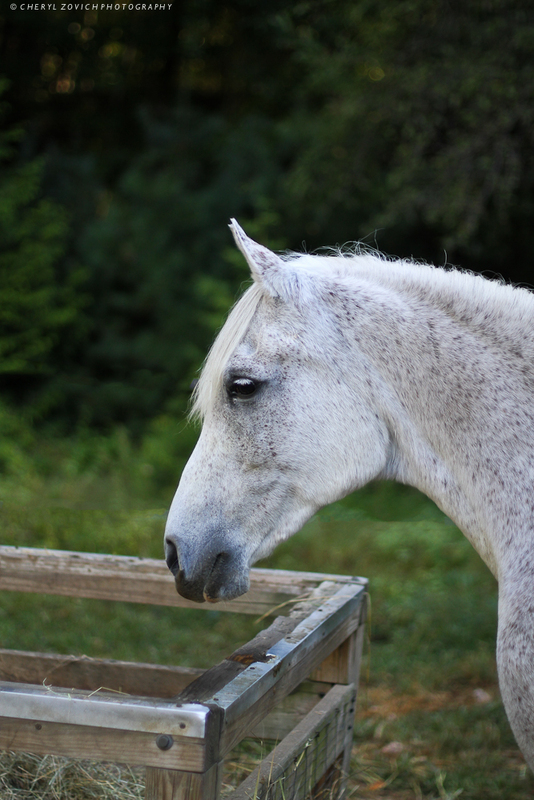 Her soft muzzle seeks my bare, cupped hands as I try to drink in every detail of her graceful elegance. I close my eyes and rest my forehead gently against hers. “Sa, sa,” I whisper again. “There, there.” My words are meant to comfort me, soothe my wounded soul, not hers. In contrast, I sense her peace, her readiness for this transition. Suspended in time, our breath flows rhythmically with the familiar ease of bodies that have shared an intimate dance countless times. We stand quietly for several moments before I bend slowly and kiss the downy softness of her nose once more. I look into her dark, wise eyes as a symphony of memories flash before me. I tell her I love her, always have, always will and her eyes, heavy now with sedation begin to close. I step closer, wrap both arms around her neck and hug her aged body gently to my own. A puff of smoke leaks from her velvety nostrils as a single deep sigh of contentment escapes. A shadow flashes overhead as a lone hawk drifts silently, circling on the thermals above. I stand shivering in the late afternoon chill. Afraid to let go, reluctant to give the final signal, I wait, trusting my heart will know the right moment. In the stillness the hawk glides unseen to a branch nearby and calls once, shrill and high. The mournful sound pierces the silence and breaks the spell; a spirit guide, come to lead the mare home. I nod to the waiting men, turn away and begin my ascent to the house. Twenty yards up the path I halt abruptly. I feel her soar; strong, powerful, free. Some days I miss Tia more than others and this has been one of those days. I don’t know why and from what I can tell, there’s no rhyme or reason to the grief process. I have few regrets except one: I was just getting started in photography in the months before Tia died and I regret that I don’t have very many pictures of her. I’d planned to take a bunch of pictures this spring, after she shed out her fuzzy winter coat, but it was not to be. So I cherish every picture of her that I have, even if they’re not the best I might have taken. Though most would be tempted to call her a flea-bitten or bloody shoulder gray, Tia was always so beautiful to me. When she was young she had gorgeous, coal black points and stockings. Her dapples stood out strongly and she had a witches mane and tail … another term for salt and pepper. As she aged she whitened considerably and lost her black markings. Then, about five or six years ago her long, full mane and tail began to thin out and lose their contrasting black strands too. Tia was petite, but refined and athletic. She had an agile, floaty way of moving and only days before she died I saw her take a kick at Bullet that had her back foot clearing his 15.3 shoulder by over a foot. Tia was congenial, but she didn’t suffer fools … human or equine, gladly. She ruled the paddock with an iron hoof and I honestly think the two geldings are a bit lost without Tia to push them around. Tia was probably the least affectionate horse I’ve ever had and it took her a long time to begin to show any kind of attachment or bond to me. She wasn’t unfriendly, she was just very aloof and not inclined to approach unless there was something (hopefully edible) in it for her. But slowly over time, I began to understand and read her. A shove of her head, a rub, a fleet but gentle nuzzle. Her love language was subtle and easy to misinterpret, but it was there. And so began our intimate understanding of one another and our private bond. Tia was always the last to approach anyone, but she would seek my attention and affection in her own subdued way. I learned to appreciate that about her, knowing that she didn’t put much value in human companionship. I would like to think I was an exception. I don’t have words to describe the emptiness I feel since Tia died. It’s not a gut-wrenching, primal pain anymore, but it’s more like a nagging ache that comes and goes at various times of the day. Our weather has been so bad since she died that part of me is relieved she’s gone. I can’t begin to fathom the stress I would be feeling if she was suffering in this miserable weather. But the selfish part of me still wishes she was here. When I see pictures of Tia the pain is palpable and raw, yet because I yearn to see her again I force myself to look. I miss you Tee-toes. The boys miss you. We hope the sun is warm and the grass is green now, but we still miss you all the same. Dec. 30, 2010. 3:50 PM. EST. Lightroom 3: Minor contrast/brightness adj. 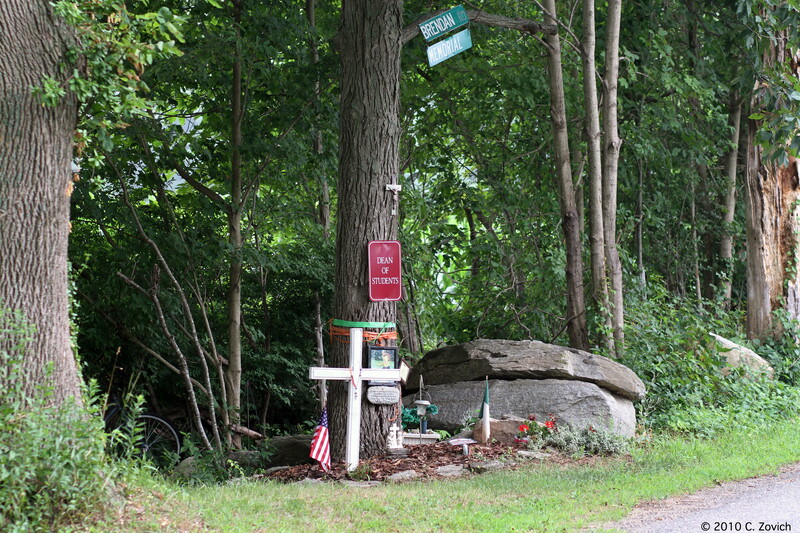 I was driving down a country road one summer day when I passed this roadside memorial. I quickly pulled over to reflect for a moment, then decided to turn around and go back to take a picture. Feeling somewhat intrusive, I didn’t read any of the memorabilia or inscriptions at the sight, so I can’t tell you anything about who this memorial was for or why it was there. But I didn’t need to inspect the details to know it was a tribute to someone who had died, probably right at that very spot. Which struck a chord with me. I wasn’t just a stranger with an unexplainable attraction to tragedy. When I was a senior in high school my former boyfriend was killed in an automobile accident. The vehicle he was driving hit a large tree, killing two of the three passengers in his van along with him. It was the second or third week after school had started, so although the exact date escapes me, it was sometime around now. We were not actually dating at the time, but we were still close and I had spoken to him just hours before the accident happened. In fact, had circumstances been slightly different, I would have been in the vehicle with him. I was at an age and stage where I was always looking for any opportunity to escape my home environment, even if only briefly. My older sister needed to run an errand and I had begged permission to hitch a ride with with her. When we arrived in town, I asked her to drop me off at the park across the street from the police station, which is where several of my friends would normally gather to hang out. I didn’t have long to socialize, but I was there when Tim drove by and stopped to visit. He told me about an outdoor party that he planned to attend later. He had some things to do before picking up a few other friends, but he offered to swing by to get me if I wanted to go. I hesitated, knowing that my sister would throttle me if I left her in the lurch, having to explain to my parents why I didn’t come home with her. I told him I’d think about it, but I knew I wouldn’t be there when he returned. My parents rules were not something to trifle with. Early the next morning I woke to the loud snap of a shade as it spun into a tight roll at the top of my bedroom window. My mother paused with her hand on the second shade and turned to look at me. “It’s time to get up,” she said. She turned, gazed out the window and went on. “And you may as well know now before you hear it from someone else, Tim O’Connor was killed in an automobile accident last night.” Having said that, she let the other shade fly, then spun on her heel and marched stiffly across room and out the door. I felt like the wind had been knocked out of me. I can recall some of the smallest details of that moment perfectly, yet I can’t remember the exact date. Go figure. As I lay there trying to process what I’d just been told, I heard sniffling. My older sister came over to my bed and sat down. With tears streaming down her face she hugged me, rocking gently. But the tears wouldn’t come for me. I was probably just in shock. When I finally made my way downstairs I was perfunctorily informed of the facts. I was told what had happened and who had died along with Tim. With a sick feeling of loss and despair I realized how close I might have come to being one of them. I never divulged this to anyone, though I imagine my older sister knew or suspected the unspoken truth. Tim’s mother asked me to attend his funeral. She was angry with most of his friends and didn’t want them to attend, but I had her blessings. So that fall afternoon my mother dropped me off outside the funeral home. I’d never been to a funeral before, not even for my own grandparents who had passed away a few years prior. With hindsight, I think it’s very odd that neither of my parents volunteered to go with me, but they didn’t like Tim and I guess they weren’t going to be hypocrites. The funeral was spartan. Tim’s senior picture sat on top of his casket; the picture I’d insisted he get and helped him pick out. It showed a handsome young man with an impish, Irish grin. His bright blue eyes twinkled in a way that thirty years later, still make me wonder if he knew some secret joke or if he was stoned. The funeral was over quickly. How much can be said about a young man whose life had barely begun? My mother had miscalculated the pickup time and with everyone leaving and no place to go, I hid behind a tree and watched as the casket was loaded into a hearse. I remained hidden as the small funeral procession slowly drove down the road and out of sight, and when I was finally alone I pressed my face against the rough bark of the tree and cried. Tim was buried in a beautiful hillside cemetery. I spent a lot of time up there that fall. I would sit by his grave and read or think. I never thought that some day I would move away, marry and have a productive life of my own. I knew we were done as a couple before Tim died, but I never realized I wouldn’t see him again. Tim was my first love. Last May I visited my hometown, and for the first time in over two decades I had a hankering to go to the cemetery. My younger sister volunteered to go with me and as it turned out, she was great comic relief. We couldn’t find Tim! We spent the better part of an hour wandering around, reading headstones and markers and trying to locate his. I had a good idea of the general area where he was buried, but everything had changed so much. Small trees were now full grown, more rows of headstones had been added … everything felt vaguely familiar, but different. We split up, and as we walked through the rows we called to each other the names of so many people we once knew. We swapped stories. We grieved. Sometimes we laughed at our memories. And finally, we found Tim. A son. A brother. A lover. A friend. To the left of Tim was another marker. I guess I didn’t realize his mother had died shortly after him. My heart ached for her. A mother never gets over that kind of loss. I didn’t know that when I was seventeen, but today I’m probably the same age she was when Tim died, and I know it now. I have a few small mementos from my years with Tim: A couple of pictures of a gangly, awkward teenager playing guitar, mowing the lawn and vamping with an older sister. The Duane Allman Anthology I gave him one Christmas. A few love letters we exchanged only months before he died. His senior picture. Every once in a great while Tim shows up in one of my dreams and when he does, he’s still a handsome, freckled, long-haired teenage man/boy. In the depths of my memory Tim never ages. He’s locked in time, eternally the age he was when he died. I was fortunate to have shared a few short years with Tim. I wonder sometimes, about the man he might have become and the life he might have lived if not for that big old tree. Roadside memorials. I’ll always feel a kinship with the living who make them.